While most of my work is obviously public, some is very private. I've visited about a dozen different children's hospitals in California, Ohio, Illinois, Maryland, Virginia and Washington, D.C., under the auspices of Pickleberry Pie, Inc. Those engagements often include bedside visits with children who can't join the group shows. These are very delicate, unpredictable opportunities to build a bridge to a child who might be very hard to reach. I'll use my best intuition for what to pull from my bag of songs and fingerplays. Things in the room might give clues as to what the child is interested in, and sometimes the child is able to tell me. I try to read and follow any cues, stay aware of what is working and what isn't, and change tacks accordingly. While this work can be trying and unsettling, it can also be very gratifying and heartwarming. It can be especially challenging when I'm not even allowed to get close to the child, let alone touch him or her. Hospitals require that I be, and have been, in good health before I'm allowed in, and that my hands are sanitized before I enter each room. And the concern about infection goes both ways. I remember one boy who was very wired, literally and figuratively, with monitors all over his scalp. I was reaching him; he was responsive and talkative. Then he signaled quietly for me to come closer and I intuited that he wanted to whisper something privately to me while his mother sat nearby. I put my ear close to him. He leaned into me and planted a loud, slobbery raspberry on my cheek. It was certainly not what I was expecting. The nurse and mother were mortified, but I laughed and said that I would take that as a love buzz. When his mother told me that was a playful ritual he had with his uncle, I knew that I had interpreted it correctly. I consider that intimate “Bronx cheer” an ovation. As I do after all my performances, when I leave a hospital, I make a point to think about what I might do differently to improve connections. Making myself actually write down these critical "reviews" helps me be better prepared in the future, and deepen the minstrel tool bag I carry with me and continually refine. It is a very different kind of toolkit than a visiting doctor's bag, but it's well documented how therapeutic smiles and laughter can be. 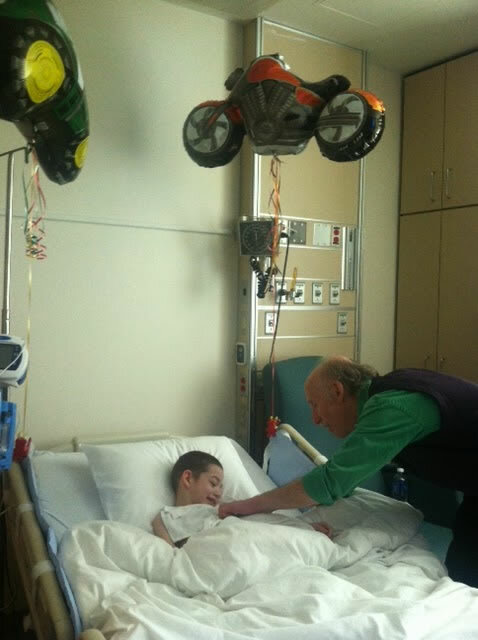 I've left many a bedside visit feeling that I’ve "done good" but usually no one other than the child knows for sure. So it was a delightful surprise when I just happened to come across a blog entry written by Kelli Thomas that documented such a visit very sweetly. I had not even been aware that the grandmother, Kelli, was watching or taking photos. What touched me most in an email exchange afterwards, was her telling me that it was the first time that her grandson had smiled during her visit. With Kelli’s permission, below is an excerpt from Quietly Blogging. It captures why I will continue to seek opportunities to brighten a child's hospital stay, always learning as I go. We often feel like we're traveling alone - that's why we pick up strangers along the way. Meet Jackson Gillman. Also known as the Stand-Up Chameleon! Once a stranger and now a fellow traveler on this ride with our Special One. 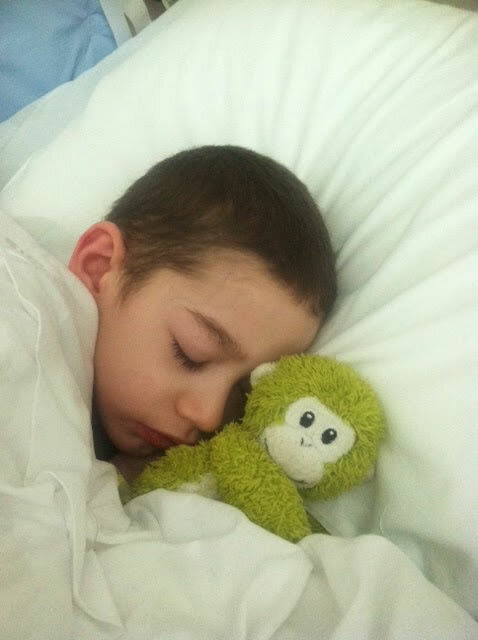 He gave Aidan his first smile of the day as he sang silly songs and used Aidan's body as an instrument. Tapping on his fingers, playing his ribcage, knocking on his knees. 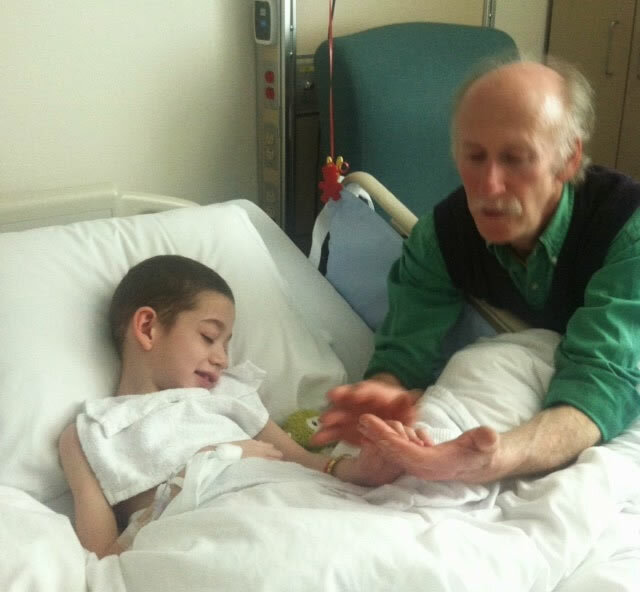 He used Aidan's hands to tell a story using each finger as a member of a family who ended up living in Aidan's heart. This was music therapy at its storytelling best. What a wonderful human being. I'm so glad we crossed paths. Amen, and so it is.